Johnny cash, Jay farrar, Eddie vedder, Leslie Javan & Delta Band, Anton Goosen & Delta Band and more. 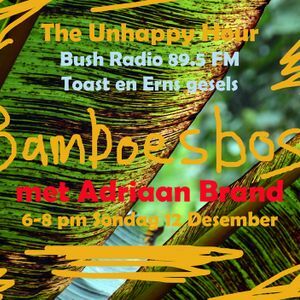 The Unhappy Hour (Sundays 6-8 pm, Bush Radio 89.5FM) broadcasts out of Cape Town, South Africa. This show featured an interview with Adriaan Brand from the Music van de Caab project at Solms-Delta wine farm. He discussed the new Bamboesbos album (featuring Cape folk, goema, awesome stuff) with Toast Coetzer and Erns Grundling. Gooi!